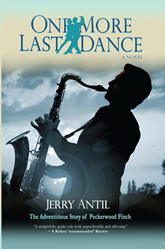 Selected as Book of the Week by BlueInk Reviews and Recommended by Kirkus Reviews editors - the Jerry Antil mystery novel - One More Last Dance - is about an aging retired black army officer who makes a dying wish at his Southern Louisiana hospice...to sit at a Newport Jazz Festival, drink wine, and eat sausages. Book release is December 25, 2017. "Fishburne or Jordan - both winners...my Gabe would be flattered." "I've never felt stronger - that this, my latest novel will be a movie," says Antil. "And to me, Laurence Fishburne, who was riveting in King of New York - my One More Last Dance might be his Scent of a Woman. As for Michael Jordan, I saw him in tears, hugging a ball on the floor after the NBA finals - no doubt thinking of his dad he had so tragically lost. I remember how touched I was, thinking when I do, Michael Jordan is my Gabe - as well. 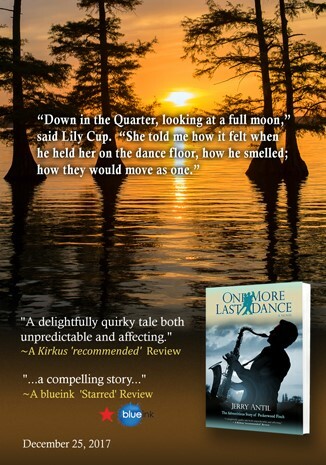 Kirkus Reviews says, "An adventure-driven novel chronicles an eventful road trip taken by a dying man and the Cajun French version of Forrest Gump. A delightfully quirky tale both unpredictable and affecting." Wishing Shelf UK Review - "...this opens big, hooking the reader in...Peck and his lawyer, Lily Cup. It's very much a Grisham-style legal thriller...reminded me of A Time To Kill." BlueInk Review - "Peck is a fisherman and mows the grass at a small hospice on a Louisiana bayou. There he meets Gabriel "Gabe" Jordan, an elderly African American man dying of cancer whose final wish is to attend the Newport Jazz Festival. Despite his own shortcomings, Peck is determined to make Gabe's dream come true." Author of the awarded Pompey Hollow Book Club historical fiction series about growing up in the shadows of WWII - Antil offers this new adult fiction genre to his repertoire - and to reviewer's open arms. Antil announced that he was donating a book to every Louisiana Public Library that wants it - as a thank you for his being captivated by the culture and romance Southern Louisiana has to offer America.